I got Skyler some animal figurines for his Easter basket. 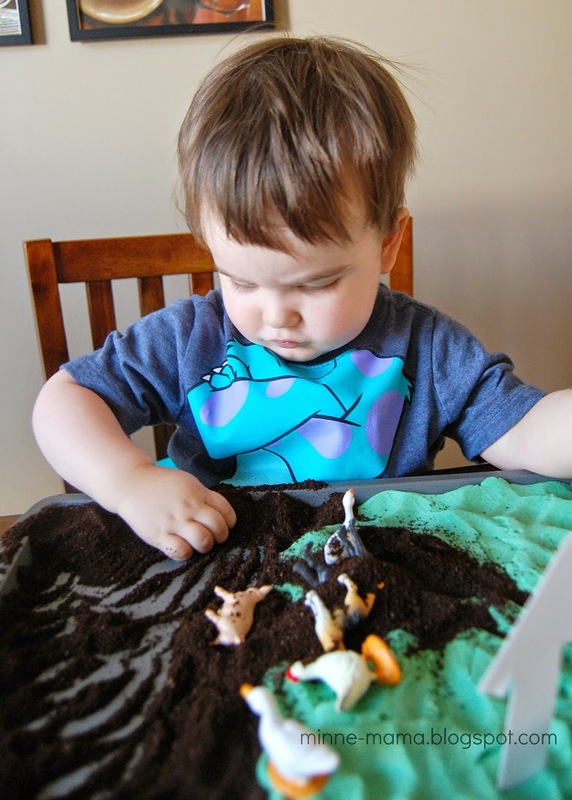 He is getting to an age where I think he will love small world play, and I was so excited when I found the Toob Farm animal set at Michael's! 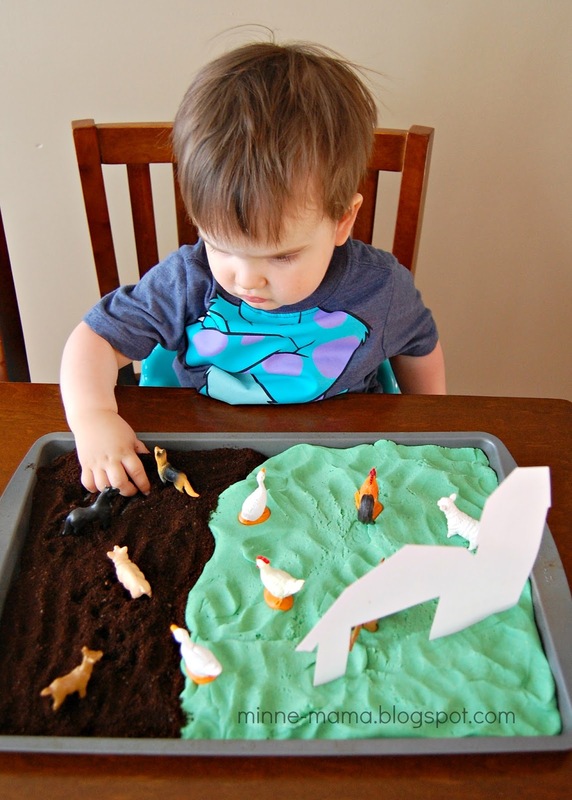 Skyler loves the book Big Red Barn by Margaret Wise Brown and this fun sensory activity was a great way to provide Skyler with a hands on activity based on the book he enjoys so much! 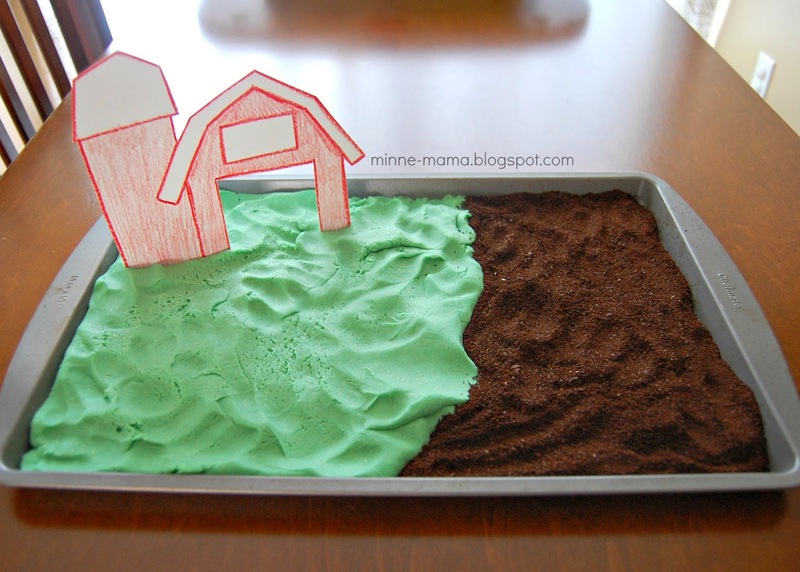 I spread our green St. Paddy's Day Dough on half of a cookie sheet, and filled the other half with coffee grounds to make grass and mud, and then all I needed was our big red barn. I looked for images of a barn, and loved this one from Learn Create Love. I didn't use the printable, I just looked at the image and drew it, but the printable is a great option! 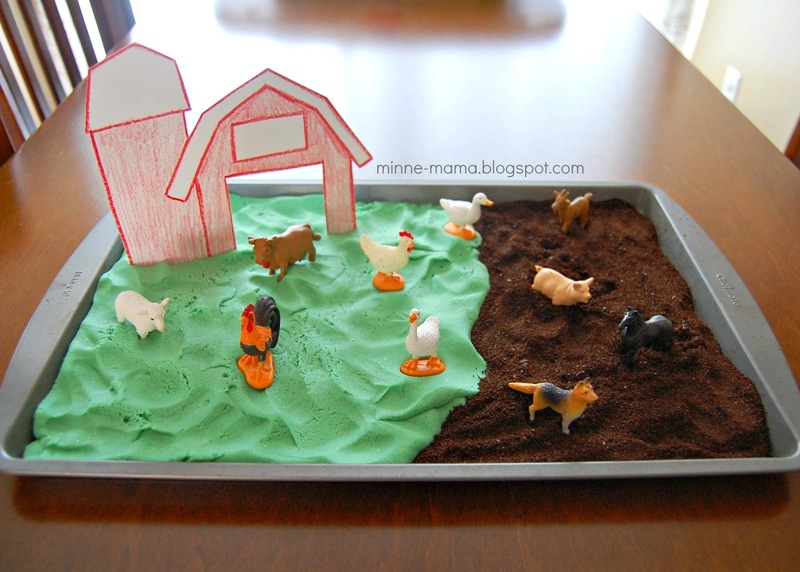 I stuck the barn in our play dough "grass" and added some farm animals. 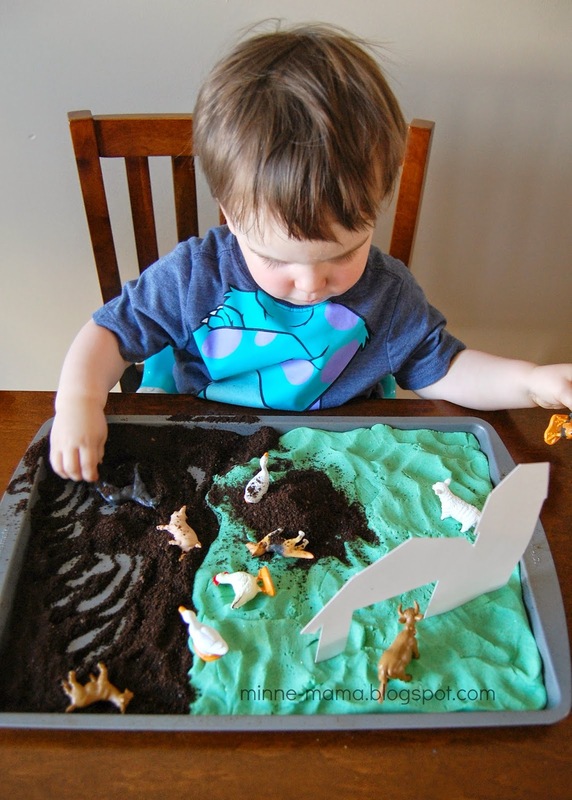 It was a perfect morning to play with this, because Skyler had been asking to play with play dough! When Skyler saw this activity he got so excited! He touched the coffee grounds and said "coffee" quietly as he ran it through his fingers. I especially loved it because it smelled SO good! 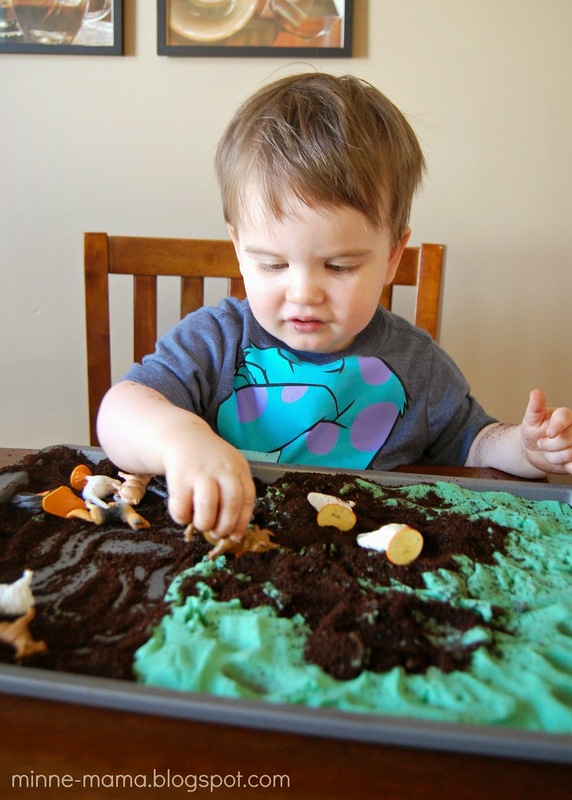 Skyler's favorite thing to do was pick up handfuls of coffee grounds, and pile them onto the play dough. 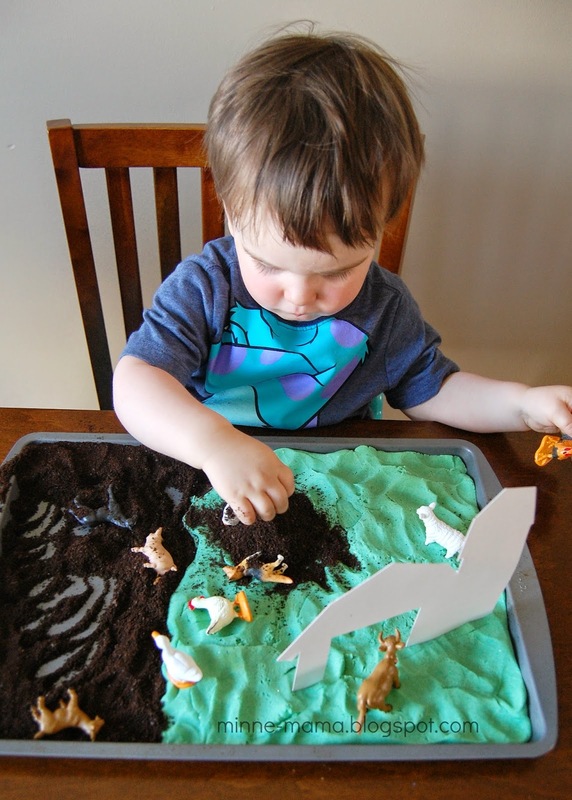 His play grass ended up looking like our poor backyard after this winter - one huge mud pit! Taking a break from feeding his animals to feel the coffee. And of course, the cow was hungry too. This was right after Skyler ate a bite of coffee grounds. His reaction was pretty hilarious. I think he is still trying to get them out in the first picture. He didn't try to eat any after that! 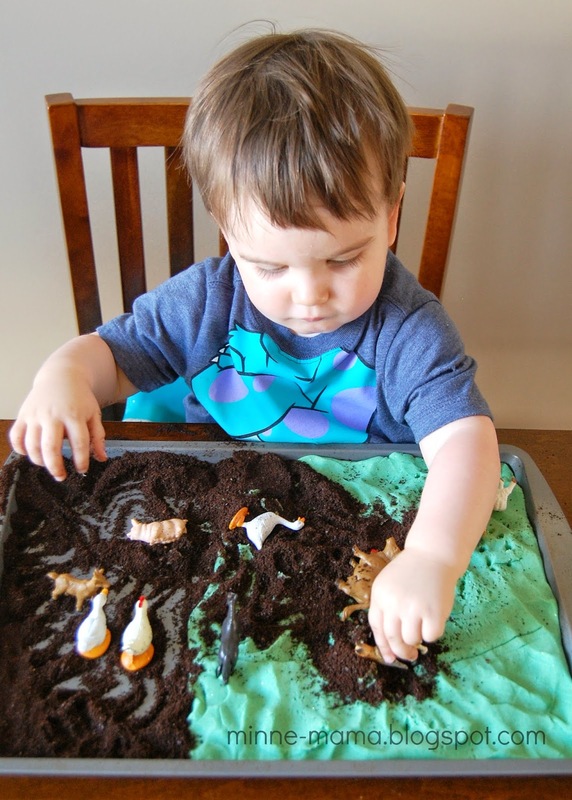 We also had fun rolling balls of play dough and coffee grounds making little speckled eggs. 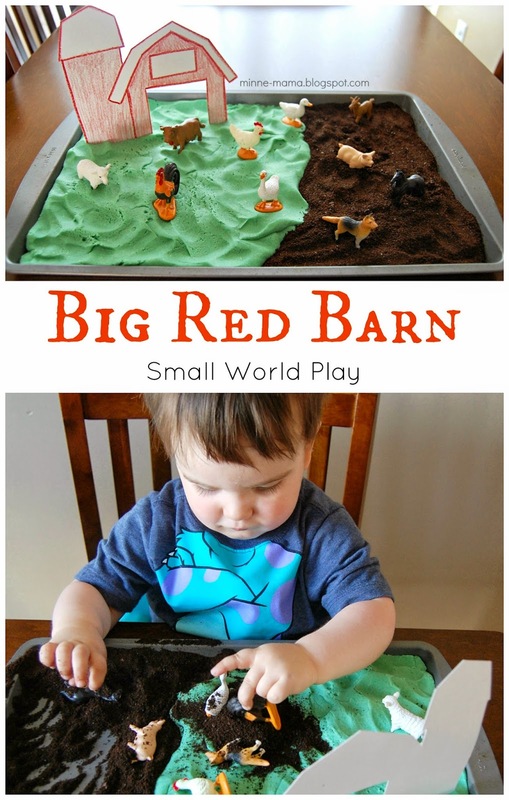 As we played, I read Skyler the Big Red Barn and he told me about the animals he had that were also in the book. 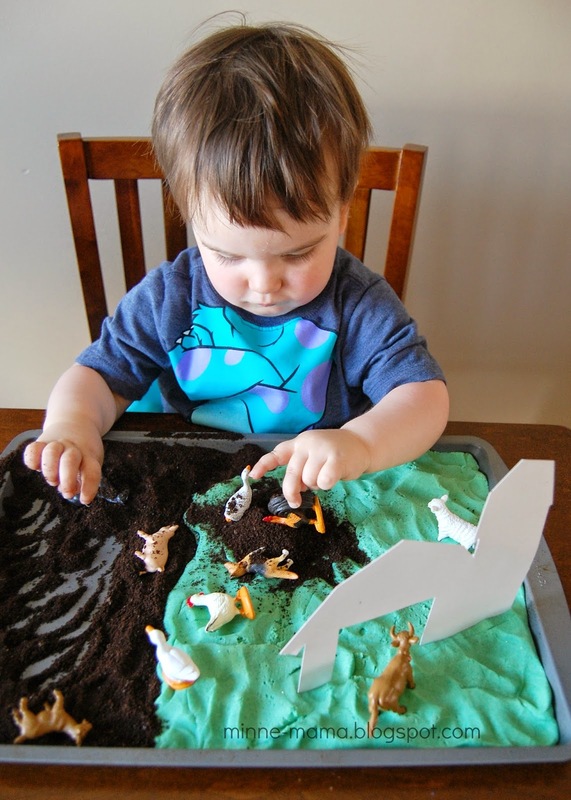 It was a lot of fun, and I know Skyler will be asking for more coffee grounds to feed his little animals all the time! 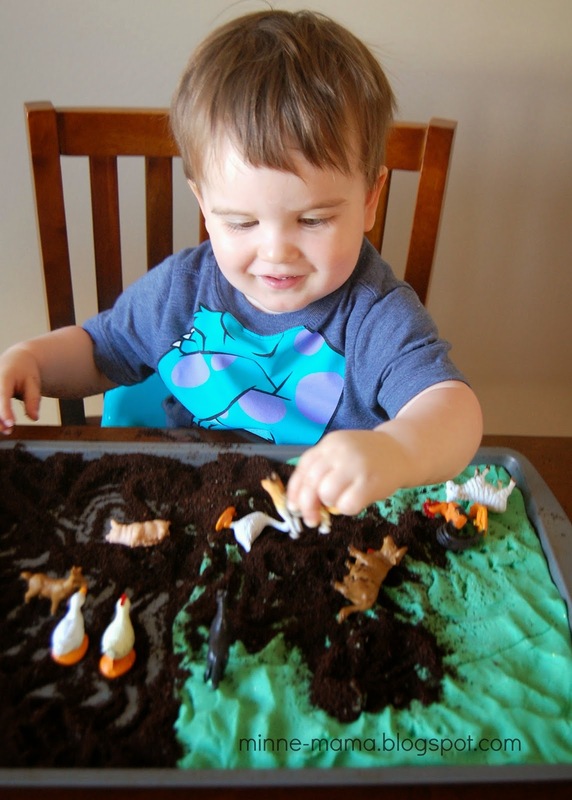 I love the different textures between the coffee grounds and the play dough. 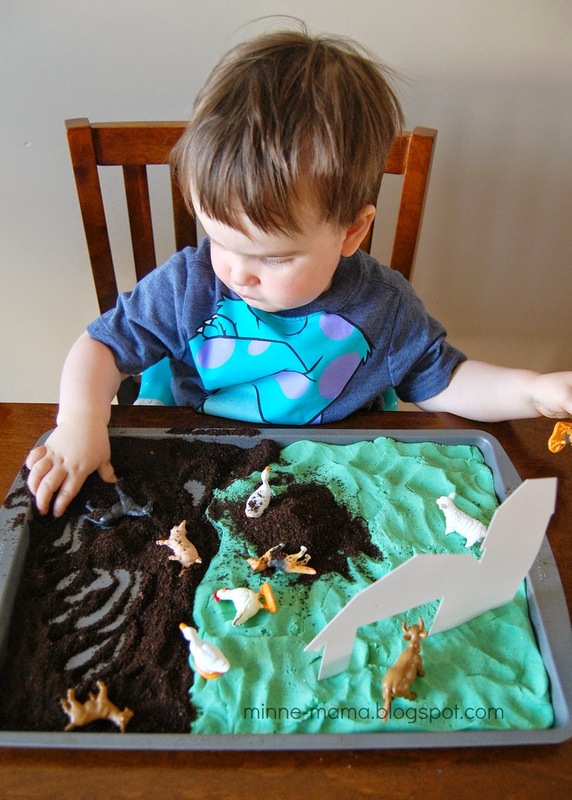 What a fun farm to play at! Thank you, Emma! 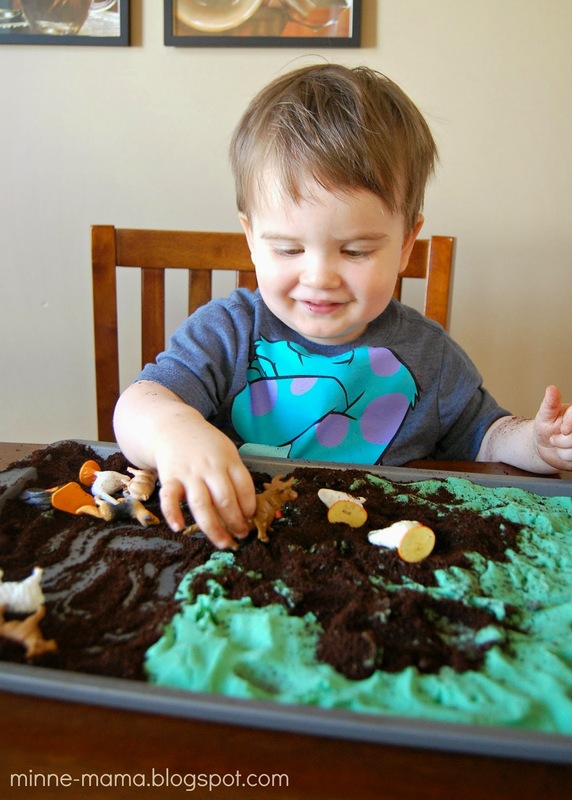 The textures were cool and rolling up the play dough with the coffee grounds in it was very different!